Inscribed on back of original canvas probably by himself: Portrait of/J. Northcote painted by himself/1784. 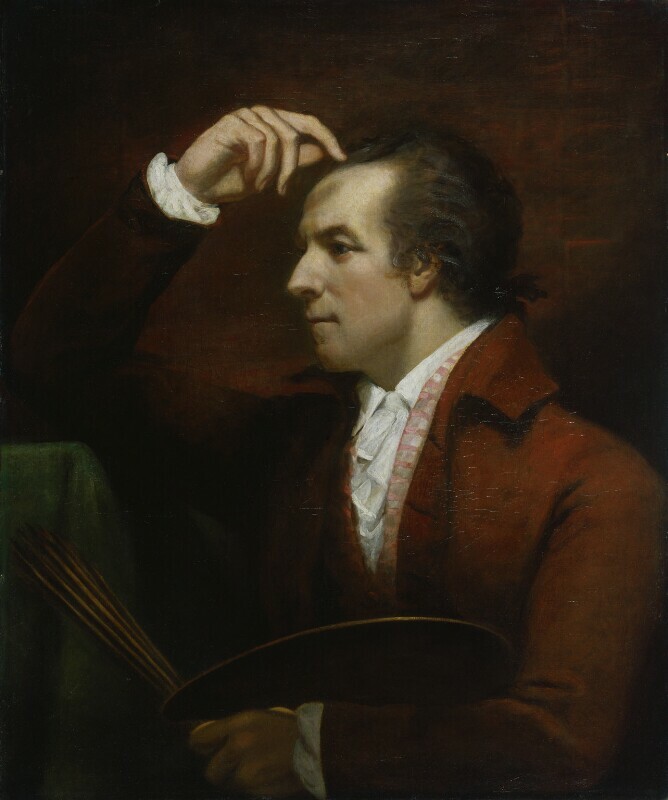 The portrait is not entered in either the MS Register or in Gwynn's appendix but it is clearly dated 1784 and shows the artist aged 38 in dramatic chiaroscuro. A version with the right hand held slightly higher is in Plymouth Art Gallery. Another version with the right hand holding a brush is among a small collection of Northcotes in Devon (private collection). Half-length profile to left with palette and brushes, right index finger pointing to forehead; dark brown hair tied in queue, dark eyes, pink complexion; reddish-brown coat, white silk waistcoat with pink stripes, white shirt and cravat; reddish-brown background. Collingssplatt collection and seen at Christie's 9 July 1884 by the Trustees (Scharf's report in registered packet); Mrs A. C. H Collingssplatt (?daughter-in-law) and bought from her 1945.